This entry was posted on 23rd April 2014 by The Salon Look Girl. I wanted to see if using expensive shampoo can really make a difference to your hair. My hair always feels amazing after going to the hairdressers, and I wondered if it was because of the shampoo and conditioner they used, as well as the professional styling afterwards. 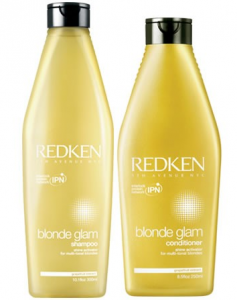 I decided to use the same brand that I have use in the salon - Redken, and this time I wanted to try the Blonde Glam shampoo and conditioner. The smell of both products is amazing, a really lovely scent. I found it clung to my hair for ages after I washed it too. The consistency of both the shampoo and conditioner is much thicker than a cheaper one. Especially the conditioner, its much thicker than normal conditioners I have used before and this made it feel much more luxurious, and more of a rich mixture. It felt more oily than other conditioners, but I have dry ends so this worked wonders on me. After washing and drying my hair, it felt super soft and nourished. For years I thought there wouldn’t be any difference in the result from a cheap against an expensive shampoo – I was wrong. 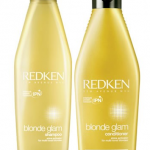 I really love the Redken Glam Blonde range and will definitely be buying it again. Try the Redken range and see what you think – I hope you love it just as much as I do!